Creating a boot environment provides a method of copying critical file systems from the active boot environment to a new boot environment. The lucreate command enables reorganizing a disk if necessary, customizing file systems, and copying the critical file systems to the new boot environment. Before file systems are copied to the new boot environment, they can be customized so that critical file system directories are either merged into their parent directory or split from their parent directory. User-defined (shareable) file systems are shared between boot environments by default. But shareable file systems can be copied if needed. Swap, which is a shareable volume, can be split and merged also. For an overview of critical and shareable file systems, see File System Types. Note - This chapter describes Live Upgrade for UFS file systems. For procedures for migrating a UFS file system to a ZFS root pool or creating and installing a ZFS root pool, see Chapter 13, Creating a Boot Environment for ZFS Root Pools. You must specify one -m option for the root (/) file system for the new boot environment. If you run lucreate without the -m option, the Configuration menu is displayed. The Configuration menu enables you to customize the new boot environment by redirecting files onto new mount points. Any critical file systems that exist in the current boot environment and are not specified in a -m option are merged into the next highest-level file system created. Only the file systems that are specified by the -m option are created on the new boot environment. If your current boot environment contains multiple file systems, and you want to have the same number of file systems in the new boot environment created, you must specify one -m option for each file system to be created. For example, if you have file systems for root (/), /opt, and /var, you would use one -m option for each file system on the new boot environment. Do not duplicate a mount point. For example, you cannot have two root (/) file systems. (Optional) Enables the creation of a boot environment description that is associated with the boot environment name (BE_name). The description can be any length and can contain any characters. Assigns the name BE_name to the active boot environment. This option is not required and is only used when the first boot environment is created. If you run lucreate for the first time and you omit the -c option, the software creates a default name for you. If the physical boot device can be determined, then the base name of the physical boot device is used to name the current boot environment. For example, if the physical boot device is /dev/dsk/c0t0d0s0, then the current boot environment is given the name c0t0d0s0. If the physical boot device cannot be determined, then names from the uname command with the -s and -r options are combined to produce the name. For example, if the uname -s returns the OS name of SunOS and the uname -r returns the release name of 5.9, then the name SunOS5.9 is given to the current boot environment. If both of the above cannot determine the name, then the name current is used to name the current boot environment. Note - If you use the -c option after the first boot environment creation, the option is ignored or an error message is displayed. If the name specified is the same as the current boot environment name, the option is ignored. If the name specified is different than the current boot environment name, then an error message is displayed and the creation fails. The following example shows a boot environment name that causes an error message. Specifies the file systems' configuration of the new boot environment in the vfstab. The file systems that are specified as arguments to -m can be on the same disk or they can be spread across multiple disks. Use this option as many times as needed to create the number of file systems that are needed. mountpoint can be any valid mount point or – (hyphen), indicating a swap partition. ufs, which indicates a UFS file system. vxfs, which indicates a Veritas file system. swap, which indicates a swap volume. The swap mount point must be a – (hyphen). For file systems that are logical devices (mirrors), several keywords specify actions to be applied to the file systems. These keywords can create a logical device, change the configuration of a logical device, or delete a logical device. For a description of these keywords, see To Create a Boot Environment With RAID-1 Volumes (Mirrors). The name of the boot environment to be created. BE_name must be unique on the system. When creation of the new boot environment is complete, it can be upgraded and can be activated (made bootable). See Chapter 5, Upgrading With Live Upgrade (Tasks). In this example, the active boot environment is named first_disk. The mount points for the file systems are noted by using the -m option. Two file systems are created, root (/) and /usr. The new boot environment is named second_disk. A description, mydescription, is associated with the name second_disk. 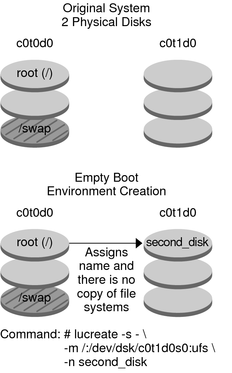 Swap, in the new boot environment second_disk, is automatically shared from the source, first_disk. Note - You can use the lucreate command with the -m option to specify which file systems and the number of file systems to be created in the new boot environment. You must specify the exact number of file systems you want to create by repeating this option. For example, a single use of the -m option specifies where to put all the file systems. You merge all the file systems from the original boot environment into one file system. If you specify the -m option twice, you create two file systems. Specifies the file systems' configuration of the new boot environment. The file systems that are specified as arguments to -m can be on the same disk or they can be spread across multiple disks. Use this option as many times as needed to create the number of file systems that are needed. When creation of the new boot environment is complete, it can be upgraded and activated (made bootable). See Chapter 5, Upgrading With Live Upgrade (Tasks). In this example, the file systems on the current boot environment are root (/), /usr, and /opt. The /opt file system is combined with its parent file system /usr. The new boot environment is named second_disk. A description, mydescription, is associated with the name second_disk. Note - When creating file systems for a boot environment, the rules are identical to the rules for creating file systems for the Oracle Solaris OS. Live Upgrade cannot prevent you from making invalid configurations on critical file systems. For example, you could enter an lucreate command that would create separate file systems for root (/) and /kernel, which is an an invalid division of the root (/) file system. When splitting a directory into multiple mount points, hard links are not maintained across file systems. For example, if /usr/stuff1/file is hard linked to /usr/stuff2/file, and /usr/stuff1 and /usr/stuff2 are split into separate file systems, the link between the files no longer exists. lucreate issues a warning message and a symbolic link is created to replace the lost hard link. (Optional) Enables the creation of a boot environment description that is associated with the boot environment name (BE_name). The description can be any length and contain any characters. In this example, the preceding command splits the root (/) file system over multiple disk slices in the new boot environment. Assume a source boot environment that has /usr, /var, and /opt on root (/): /dev/dsk/c0t0d0s0 /. A description, mydescription, is associated with the boot environment name second_disk. Swap slices are shared between boot environments by default. By not specifying swap with the -m option, your current and new boot environment share the same swap slices. If you want to reconfigure the new boot environment's swap, use the -m option to add or remove swap slices in the new boot environment. Note - The swap slice cannot be in use by any boot environment except the current boot environment or if the -s option is used, the source boot environment. The boot environment creation fails if the swap slice is being used by any other boot environment, whether it is a swap, UFS, or any other file system. You can create a boot environment with the existing swap slices and then edit the vfstab file after the creation. The name of the boot environment to be created. BE_name must be unique. The new boot environment is created with swap moved to a different slice or device. In this example, the current boot environment contains root (/) on /dev/dsk/c0t0d0s0 and swap is on /dev/dsk/c0t0d0s1. The new boot environment copies root (/) to /dev/dsk/c0t4d0s0 and uses both /dev/dsk/c0t0d0s1 and /dev/dsk/c0t4d0s1 as swap slices. A description, mydescription, is associated with the boot environment name second_disk. These swap assignments are effective only after booting from second_disk. If you have a long list of swap slices, use the -M option. See To Create a Boot Environment and Reconfigure Swap by Using a List. If you have a long list of swap slices, create a swap list. lucreate uses this list for the swap slices in the new boot environment. Note - The swap slice cannot be in use by any boot environment except the current boot environment or if the -s option is used, the source boot environment. The boot environment creation fails if the swap slice is being used by any other boot environment, whether the swap slice contains a swap, UFS, or any other file system. List of -m options, which are collected in the file slice_list. Specify these arguments in the format that is specified for -m. Comment lines, which begin with a hash mark (#), are ignored. The -M option is useful when you have a long list of file systems for a boot environment. Note that you can combine -m and -M options. For example, you can store swap slices in slice_list and specify root (/) and /usr slices with -m.
The -m and -M options support the listing of multiple slices for a particular mount point. In processing these slices, lucreate skips any unavailable slices and selects the first available slice. In this example, swap in the new boot environment is the list of slices that are noted in the /etc/lu/swapslices file. A description, mydescription, is associated with the name second_disk. If you want a shareable file system to be copied to the new boot environment, specify the mount point to be copied with the -m option. Otherwise, shareable file systems are shared by default, and maintain the same mount point in the vfstab file. Any updating that is applied to the shareable file system is available to both boot environments. In this example, the current boot environment contains two file systems, root (/) and /home. In the new boot environment, the root (/) file system is split into two file systems, root (/) and /usr. The /home file system is copied to the new boot environment. A description, mydescription, is associated with the boot environment name second_disk. The lucreate command creates a boot environment that is based on the file systems in the active boot environment. If you want to create a boot environment based on a boot environment other than the active boot environment, use lucreate with the -s option. Note - If you activate the new boot environment and need to fall back, you boot back to the boot environment that was last active, not the source boot environment. Specifies the source boot environment for the new boot environment. The source would not be the active boot environment. In this example, a boot environment is created that is based on the root (/) file system in the source boot environment named third_disk. Third_disk is not the active boot environment. A description, mydescription, is associated with the new boot environment named second_disk. The lucreate command creates a boot environment that is based on the file systems in the active boot environment. When using the lucreate command with the -s - option, lucreate quickly creates an empty boot environment. The slices are reserved for the file systems that are specified, but no file systems are copied. The boot environment is named, but not actually created until installed with a Flash Archive. When the empty boot environment is installed with an archive, file systems are installed on the reserved slices. Create the empty boot environment. Specifies that an empty boot environment be created. In this example, a boot environment is created but contains no file systems. A description, mydescription, is associated with the new boot environment that is named second_disk. When creation of the empty boot environment is complete, a Flash archive can be installed and can be activated (made bootable). See Chapter 5, Upgrading With Live Upgrade (Tasks). For an example of creating and populating an empty boot environment, see Example of Creating an Empty Boot Environment and Installing a Flash Archive . The following image shows the creation of an empty boot environment. When you create a boot environment, Live Upgrade uses Solaris Volume Manager technology to create RAID-1 volumes. When creating a boot environment, you can use Live Upgrade to manage the following tasks. Remove a single-slice concatenation (submirror) from a RAID-1 volume (mirror). The contents can be saved to become the content of the new boot environment if necessary. Because the contents are not copied, the new boot environment can be quickly created. After the submirror is detached from a mirror, it is no longer part of the original mirror. Reads and writes to the submirror are no longer performed through the mirror. Create a boot environment that contains a mirror. Attach a single-slice concatenation to the newly created mirror. To use the mirroring capabilities of Live Upgrade, you must create a state database and a state database replica. A state database stores information about disk about the state of your Solaris Volume Manager configuration. For information about creating a state database, see Chapter 6, State Database (Overview), in Solaris Volume Manager Administration Guide. For an overview of Solaris Volume Manager and the tasks that Live Upgrade can provide, see Creating a Boot Environment With RAID-1 Volume File Systems. For in-depth information about complex Solaris Volume Manager configurations that are not allowed when using Live Upgrade, see Chapter 2, Storage Management Concepts, in Solaris Volume Manager Administration Guide. (Optional) Enables the creation of a boot environment description that is associated with the boot environment name BE_name. The description can be any length and can contain any characters. For file systems that are logical devices (mirrors), several keywords specify actions to be applied to the file systems. These keywords can create a logical device, change the configuration of a logical device, or delete a logical device. mirror creates a RAID–1 volume or mirror on the specified device. In subsequent -m options, you must specify attach to attach at least one concatenation to the new mirror. The specified device must be correctly named. For example, a logical device name of /dev/md/dsk/d10 can serve as a mirror name. For more information about naming devices, see Overview of Solaris Volume Manager Components in Solaris Volume Manager Administration Guide. detach removes a concatenation from a volume that is associated with a specified mount point. The volume does not need to be specified. attach attaches a concatenation to the mirror that is associated with a specified mount point. The physical disk slice that is specified is made into a single device concatenation for attaching to the mirror. To specify a concatenation to attach to a disk, you append a comma and the name of that concatenation to the device name. If you omit the comma and the concatenation name, lucreate selects a free volume for the concatenation. lucreate allows you to create only concatenations that contain a single physical slice. This command allows you to attach up to three concatenations to a mirror. preserve saves the existing file system and its content. This keyword enables you to bypass the copying process that copies the content of the source boot environment. Saving the content enables a quick creation of the new boot environment. For a particular mount point, you can use preserve with only one physical device. When you use preserve, lucreate checks that the device's content is suitable for a specified file system. This check is limited and cannot guarantee suitability. The preserve keyword can be used with both a physical slice and a Solaris Volume Manager volume. If you use the preserve keyword when the UFS file system is on a physical slice, the content of the UFS file system is saved on the slice. In the following example of the -m option, the preserve keyword saves the content of the physical device c0t0d0s0 as the file system for the mount point for the root (/) file system. If you use the preserve keyword when the UFS file system is on a volume, the contents of the UFS file system are saved on the volume. In the following example of the -m option, the preserve keyword saves the contents of the RAID-1 volume (mirror) d10 as the file system for the mount point for the root (/) file system. In the following example of the -m option, a RAID-1 volume (mirror) d10 is configured as the file system for the mount point for the root (/) file system. The single-slice concatenation d20 is detached from its current mirror. d20 is attached to mirror d10. The root (/) file system is preserved on submirror d20. When the creation of the new boot environment is complete, it can be upgraded and can be activated (made bootable). See Chapter 5, Upgrading With Live Upgrade (Tasks). In this example, the mount points for the file systems are specified by using the -m option. A description, mydescription, is associated with the name another_disk. lucreate configures a UFS file system for the mount point root (/). A mirror, d10, is created. This mirror is the receptacle for the current boot environment's root (/) file system that is copied to the mirror d10. All data on the mirror d10 is overwritten. Two slices, c0t0d0s0 and c0t1d0s0, are submirrors, d1 and d2. These two submirrors are added to mirror d10. The new boot environment is named another_disk. Two slices, c0t0d0s0 and c0t1d0s0, are specified to be used as submirrors. The submirrors are not specified, but the lucreate command chooses names from a list of available volume names. These two submirrors are attached to mirror d10. lucreate configures a UFS file system for the mount point root (/). A mirror, d10, is created. Slice c0t0d0s0 is removed from its current mirror. The slice is specified to be submirror d1 and is added to mirror d10. The contents of the submirror, the root (/) file system, are saved and no copy occurs. Slice c0t1d0s0 is submirror d2 and is added to mirror d10. lucreate configures a UFS file system for the mount point root (/). A mirror, d20, is created. Slice c0t0d0s0 is removed from its current mirror and added to the mirror d20. The name of the submirror is not specified. The contents of the submirror, the root (/) file system, are saved and no copy occurs. When the creation of the new boot environment is complete, the boot environment can be upgraded and can be activated (made bootable). See Chapter 5, Upgrading With Live Upgrade (Tasks). Two slices, c0t0d0s0 and c0t1d0s0, are submirrors d1 and d2. These two submirrors are added to mirror d10. lucreate configures UFS file system for the mount point /opt. A mirror, d11, is created. This mirror is the receptacle for the current boot environment's /opt file system that is copied to the mirror d11. All data on the mirror d11 is overwritten. Two slices, c2t0d0s1 and c3t1d0s1, are submirrors d3 and d4. These two submirrors are added to mirror d11. The content of the file system on the new boot environment can be modified by using the following options. Directories and files are not copied to the new boot environment. Excludes files and directories by not copying them to the new boot environment. You can use multiple instances of this option to exclude more than one file or directory. exclude_dir is the name of the directory or file. Copies directories and files that are listed to the new boot environment. This option is used when you have excluded a directory, but want to restore individual subdirectories or files. include_dir is the name of the subdirectory or file to be included. Copies directories and files from a list to the new boot environment. This option is used when you have excluded a directory, but want to restore individual subdirectories or files. list_filename is the full path to a file that contains a list. If a line item is a directory, all subdirectories and files beneath that directory are included. If a line item is a file, only that file is included. Uses a list to exclude directories and files by not copying them to the new boot environment. Uses a list to copy directories and files to the new boot environment. Each file or directory in the list is noted with a plus “+” or minus “-”. A plus indicates an included file or directory and the minus indicates an excluded file or directory. The list_filename file must contain one file per line. A space must follow the plus or minus before the file name. If a line item is a directory and is indicated with a + (plus), all subdirectories and files beneath that directory are included. If a line item is a file and is indicated with a + (plus), only that file is included. Overrides the integrity check of system files. Use this option with caution. To prevent you from removing important system files from a boot environment, lucreate runs an integrity check. This check examines all files that are registered in the system package database and stops the boot environment creation if any files are excluded. Use of this option overrides this integrity check. This option creates the boot environment more quickly, but might not detect problems. In this example, the new boot environment is named second_disk. The source boot environment contains one file system, root (/). In the new boot environment, the /var file system is split from the root (/) file system and put on another slice. The lucreate command configures a UFS file system for the mount points root (/) and /var. Also, two /var mail files, root and staff are not copied to the new boot environment. Swap is automatically shared between the source and the new boot environment. In this example, the new boot environment is named second_disk. The source boot environment contains one file system for the OS, root (/). The source also contains a file system that is named /mystuff. lucreate configures a UFS file system for the mount points root (/) and /mystuff. Only two directories in /mystuff are copied to the new boot environment: /latest and /backup. Swap is automatically shared between the source and the new boot environment.